Want to reduce the number of flying Yellow jackets around your property and keep them away from your deck pool, swing set, food and guests? Yellow jacket trapping is an effective way to reduce the number of Yellow jackets around your home. In the event that you have an active Yellow jacket nest on your property, schedule service online by clicking the button below. Same day or next day service is typically available. 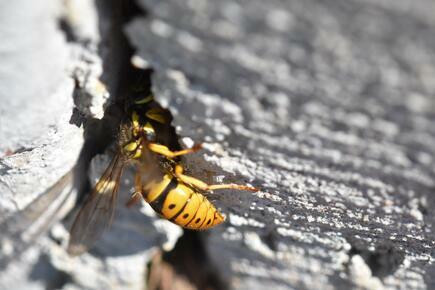 Yellow jackets are sometimes mistakenly called "bees", but Yellow jackets are actually wasps. They may be confused with other wasps, such as hornets and paper wasps. Yellow jackets typically have a yellow and black head/face and patterned abdomen. Yellow jacket stings can pose significant health threats to humans since they are territorial and can sting if threatened. They are known to repeatedly sting and can also cause allergic reactions. It is believed that Yellow jackets and other stinging insects send over 500,000 people to the emergency room each year. If you have yellow jackets at your home, order our One-Time Wasp Nest Removal service for same day or next day service. Yellow jackets can be found anywhere humans are found. They build paper carton nests out of chewed up cellulose, which are usually found in the ground or in cavernous areas such as eaves and attics. Following are some tips to avoid potential Yellow jacket stings. Do not swat at Yellow jackets since this may increase the likelihood of an aggressive response. Yard work and gardening should be done with caution. Wearing shoes and socks and using work gloves will prevent stings on hands and feet. Check the inside your mailbox before putting your hand in. Seek immediate medical attention if stung since reactions can be severe.